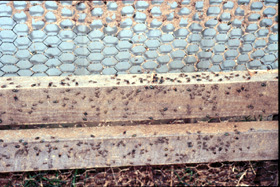 Flies collecting on the outside walls of a poultry building. Hurricanes and other severe storms can create numerous pest problems for farmers. As the flood water recedes from fields, water-logged vegetables, field crops, and baled hay may begin to decay before farmers are able to get back into these fields. Wind and heavy rain can damage poultry and hog houses, horse barns and other livestock structures. The first concern, of course, will be to care for the animals and repair damage as soon as possible. However, fly numbers are likely to rise dramatically around poultry houses and other dry waste systems such as horse barns and cattle lots in the wake of a hurricane. Confinement hog houses and some layer operations with liquid waste handling systems should not experience severe fly outbreaks unless they are unable to flush wastes into the lagoons for a week or more. Poultry houses (broilers, breeders, turkeys) that have lost any portion of their roof are particularly vulnerable. Wind blown rain will wet large areas of litter and/or manure, even if a building’s roof remains intact, especially where side curtains or end doors were damaged by the storm. Rain soaked feed spills from damaged feed bins are another concern, as are storm related disruptions of carcass disposal. The mix of organic matter + moisture + warm temperatures will produce a large spike in fly populations within 10 days. Remove and dispose of wet litter/manure/feed/etc. as soon as possible. Obviously, this will not be practical or even possible in many cases. Wet litter/bedding can be replaced with fresh shavings/straw where removal is possible. Dispose of wet material by land application or composting if local conditions will allow it. 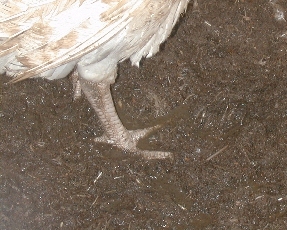 Additional dry material (shavings or chopped straw) may be required to make a drier mixture for successful composting. can be mixed with equal or greater amounts of fresh bedding/litter. Increase airflow as much as possible over wet areas to evaporate excess moisture. If electricity is available, continuous high-volume air flow will be most effective. 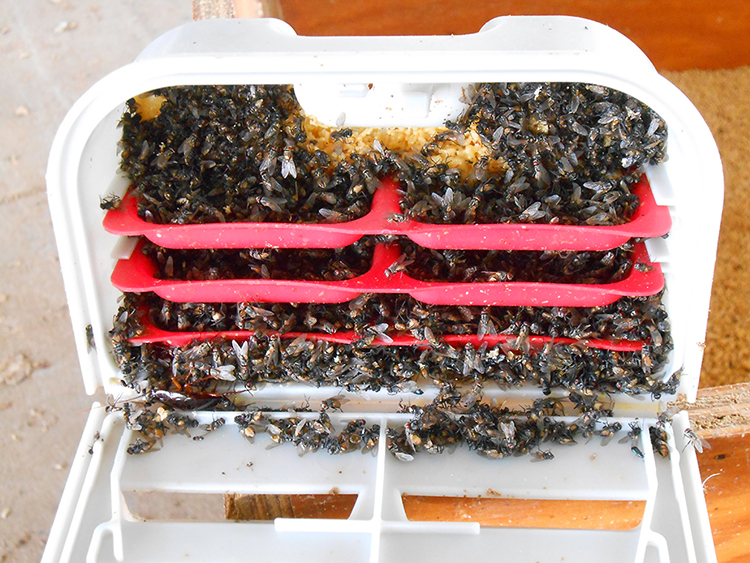 Fly baits usually help manage flies but may be less effective when large amounts of organic debris are present. Be prepared to apply insecticides to manage fly outbreaks. Baits are usually an important tool in fly management, but they may be less effective in these situations due to the large amount of available organic material. Neporex (cyromazine) is a good larvacidal product, but it has restrictions on the application of treated litter to fields afterward. It cannot be applied onto fields that are planted to grains and will be harvested or grazed because it accumulates in the seed. For quicker knockdown of adult fly populations, products such as permethrin and RaVap® will be most effective as surface sprays on interior building walls. Products containing a pyrethroid, such as cyfluthrin or lambda-cyhalothrin, can be applied to exterior surfaces as well as to interior surfaces when livestock and birds can be removed prior to treatment. Do not treat interior walls if animals are present unless the product label allows it. Do not apply these products where there is standing water present. These chemicals will provide good fly control for about 10-14 days. Use spot treatments to eliminate concentrations of maggots where there are isolated areas of wet material. Use broadcast treatments only when most or all of the manure, litter or bedding area has been saturated. 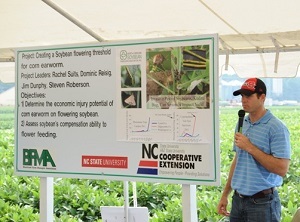 RaVap®, Rabon® or dimethoate are effective spot treatment insecticides for maggot control. Space sprays (fogs) with pyrethins, PBO-synergized permethrin, or other approved insecticides can be used effectively for rapid knockdown of adult flies (but will not impact directly on maggots in decaying material). Check the North Carolina Agricultural Chemicals Manual for additional information. Cover with black plastic to aid solar heating and shed rainfall. Finally, here’s a caution about land application of wastes as a method of disposal. Be careful about where the material is spread. Avoid land application within a mile or two of residences if at all possible. but those survivors can still create a fly nuisance even when the waste is thoroughly incorporated. Application and incorporation will destroy all but 1% to 5% of the fly larvae and pupae, but even this relatively small percentage of survivors can produce thousands of flies if the manure/litter/bedding is heavily infested.